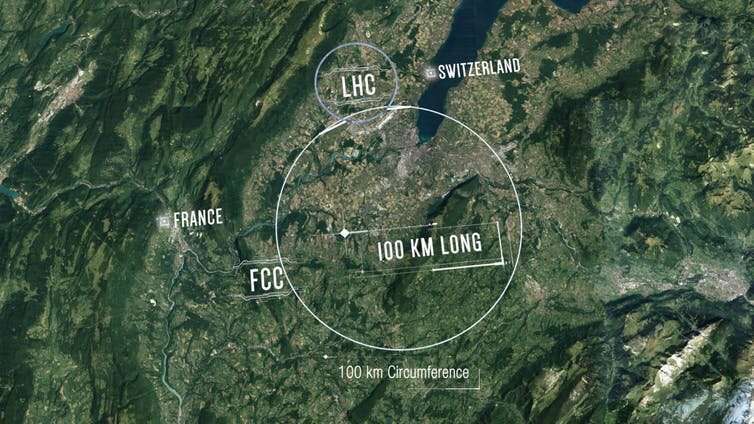 The "Future Circular Collider" is conceived as a successor to the LHC, and – if given the green light – it would allow physicists to seek answers to some of greatest mysteries in physics. This includes finding out what the vast majority of the universe is actually made of or discovering entirely new physics. The proposal envisages a new 100km circumference tunnel that would be bored through the Earth, encircling the city of Geneva and the surrounding countryside. The 27km LHC would feed particles into the the new collider – like a motorway slipway. This would ultimately allow it to collide particles with energies around seven times higher than the LHC can manage. This would let this collider create particles that are beyond the reach of the LHC – pushing particle physics deep into an unexplored microscopic realm. The Future Circular Collider is really several projects in one. The first phase imagines a machine that collides electrons with their so-called "antimatter versions," positrons. All particles are thought to have an antimatter companion, virtually identical to itself but with opposite charge. When a matter and an antimatter particle meet, they completely annihilate each other, with all their energy converted into new particles. The collision energy of such a collider could be very precisely controlled. Also, collisions would be very "clean" compared to the LHC, which collides protons (particles that make up the atomic nucleus along with neutrons). Protons are not fundamental particles like electrons, but haphazard bags of smaller particles including quarks and gluons. When protons collide, their innards get sprayed all over the place, making it much harder to spot new particles among the debris. Such precision measurements offer numerous possibilities for new discoveries. One of the most tantalising is that the Higgs could act as portal connecting the world of ordinary atomic matter that we inhabit, with a hidden world of particles that are otherwise undetectable. Some 85% of all the matter in the universe in the universe is "dark," made up of particles we have never been able to see. We only know it exists because of the gravitational pull it has on surrounding matter. Excitingly, an electron-positron collider could reveal the Higgs boson decaying into these hidden particles. In the second phase, the collider would be replaced by a far more powerful proton-proton collider – reaching collision energies of 100 trillion electron volts. This would be a discovery machine, capable of creating a huge range of new particles that physicists suspect may lie beyond the reach of the LHC. In particular, it would almost completely explore the energy range where most forms of dark matter are likely to be found. It would also be able to probe the conditions that existed a trillionth of a second after the Big Bang. This moment in the universe's history is crucial as it is when the Higgs field – an all-pervading energy field that the Higgs boson is a little ripple in – collapsed into its current state, which is what generated the masses of the fundamental particles. Understanding how the Higgs field acquired its current energy is one of the greatest outstanding problems in physics, as it appears to be unbelievably finely tuned to allow atoms – and therefore stars, planets and people – to exist. As a physicist working on the LHC beauty experiment, I personally hope this new collider could eventually also help us solve the riddle of why the universe is made almost entirely from matter and not antimatter. The first phase of the new collider would come online in the 2040s, after the final run of the upgraded LHC. The more powerful proton-proton collider would be installed in the 2050s. 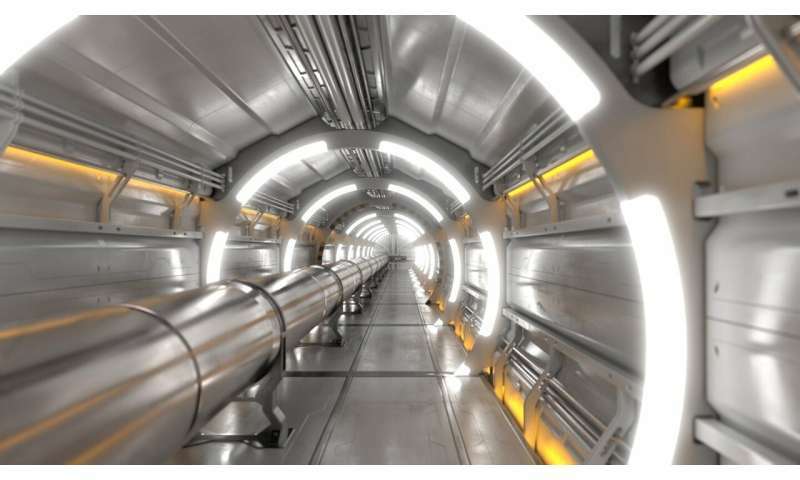 Both projects come with a hefty price tag: €9 billion for the electron-positron machine and a further €15 billion for the proton-proton collider. This has raised understandable criticism that the money could be better spent elsewhere, for example in tackling climate change. John Womersley, a senior physicist involved in the Future Circle Collider, told me that beyond the value of fundamental knowledge in its own right, there will be other significant short-term benefits. He said: "The FCC will push the development of innovative technologies to solve new challenges. The World Wide Web, Wi-Fi and superconducting magnets in MRI machines were all developed to meet the needs of fundamental physics." The project also has huge power to inspire the next generation of physicists. Ultimately, such an ambitious scheme will only be possible through a large international collaboration, with funding from dozens of countries. The project already includes 1,300 contributors from 150 universities, research institutes and industrial partners around the world. 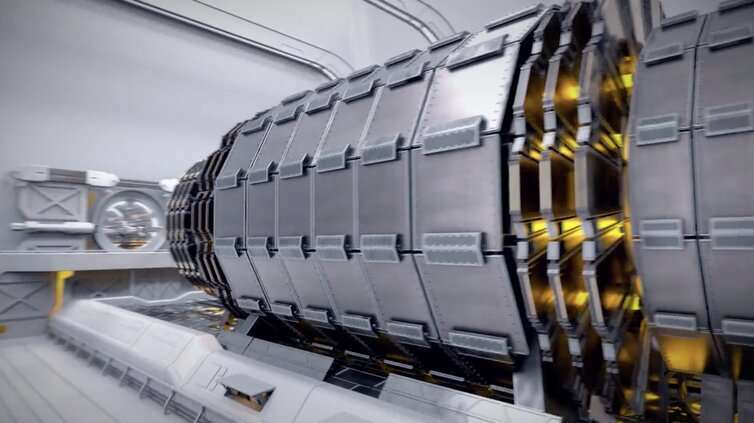 Meanwhile, a similar collider project is also being considered by China, perhaps the only country capable of mobilising the resources necessary to build such a vast machine on its own. The advocates of the Future Circular Collider hope that the project will be adopted in the new European strategy for particle physics, to be published in 2020. If accepted, it will begin a long process of research and development, but also of persuading national governments and the general public that the exciting fundamental research that could be performed at the collider is worth investing in. The political challenges are undoubtedly enormous, but physicists are determined not to give up the quest for a deeper understanding of our universe. How are they going to prevent a 100TeV collider from frying its own detectors in the spray of energetic debris? Do we have evidence from cosmic ray experiments that 100TeV will reveal what 14TeV cannot? The unification energies where really interesting stuff happens are still out of reach. We could get lucky and find higher energy supersymmetry particles but its an expensive gamble. Better to gamble on knowledge than a return on an investment poured down the blackhole of welfare. Besides, this is real trickle-down economics. Will 100TeV reveal what 14TeV will not? Of course, remember that a negative result is a fruitful result establishing limits on phenomena. It's not a "replacement." It's an electron collider. On Earth. I am not going to argue about any social v science expenditure since I know little about costs involved on both sides. Such arguments are best left to those who have he figures. I all for scientific advancement and I'm sure the building of the proposed FCC would enhance engineering know how too. But I'm just wondering how far can we really go with such structures. For example, would the the FCC be more susceptible to damage purely due to natural movement in the ground? What about the maintenance, that is, how much higher are the costs of just 'general wear and tear compared to the LHC? I'm not really criticizing just kind of think out loud. Would the money be better spent on say Laser (so called) 'table top' accelerators technology? Again, I don't know so just asking. As far as the matter / anti-matter balance is concerned, neutrino physics is currently promising (the right size of the symmetry fractures). And AFAIU the new measurement of the electron's roundness in the EM largely dismissed all LHC / FCC WIMP dark material candidates. But, what can we do, the energy field has to be explored if we can, and preferably before today's particle physicists lose knowledge. Hopefully, we will only build one of the machines and instead cooperate on dual detectors as in the LHC. @EyeNStein: The circumstances (low event frequency, remote detectors) makes it hard to translate CR into precision particle physics, so my guess is we can't see anything in it for natural reasons but need accelerators. @Doug_Nightmare: I would say the utility is equal, but the marginal utility implies we should never do just one thing. @MiMath: I think the table top accelerators are coming, but in later, smaller accelerators at first. This is a conservative proposal. Well we may use it to discover how to produce antimatter in bulk for storage in the ITER magnetic bottle, which just happens to lie due south, in the same direction as this proposed expansion. And it just so happens that a spaceport nearby on the Riviera could launch antimatter-fueled ships out across the Mediterranean. One additional ring of a similar increase in magnitude should bring it to the vicinity. And room temp superconductors should make producing grams of it quite easy, as well as storing it relatively safely inside a suitable vessel.